BACK TO THE BEACH! 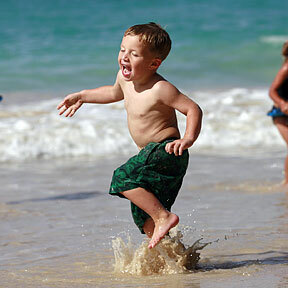 Caleb Austin, 3, frolicked on the shore of Kailua Beach Park yesterday afternoon. Opposition to the residential project leaves the developer hoping for the governor's veto. Budget issues will hit Lingle's $120 million plan, lawmakers say. Five seniors showcase their work at the annual UH fashion show before graduating into the commercial marketplace. Hawaii and this week's opponent, Sacramento State, are both 1-1/2 games out of first place. The Ironworkers Union says Costco did not give local firms the chance to bid on work in Kapolei. Proposals to change the rules for medical malpractice lawsuits has died in this year's Legislature.